Hello! 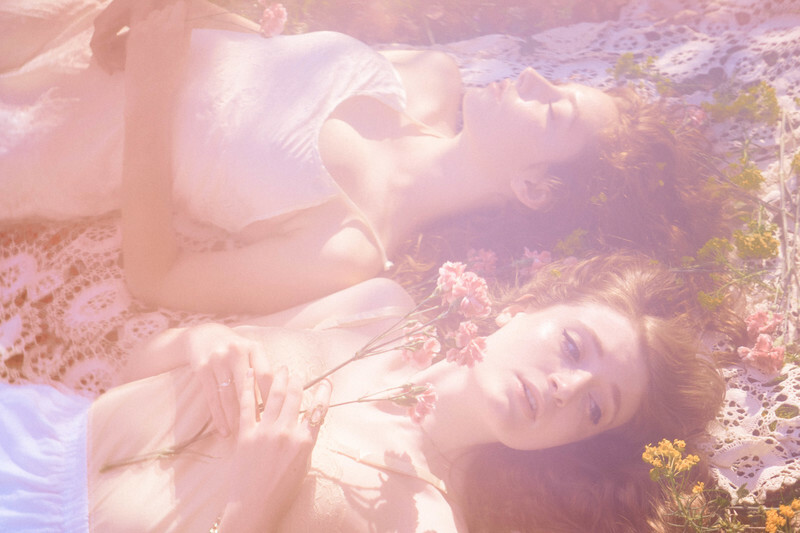 I recently teamed up with Elissa Rumford and Katelynn Adams to work on a collaborative editorial photoshoot for Spring/Summer '18. 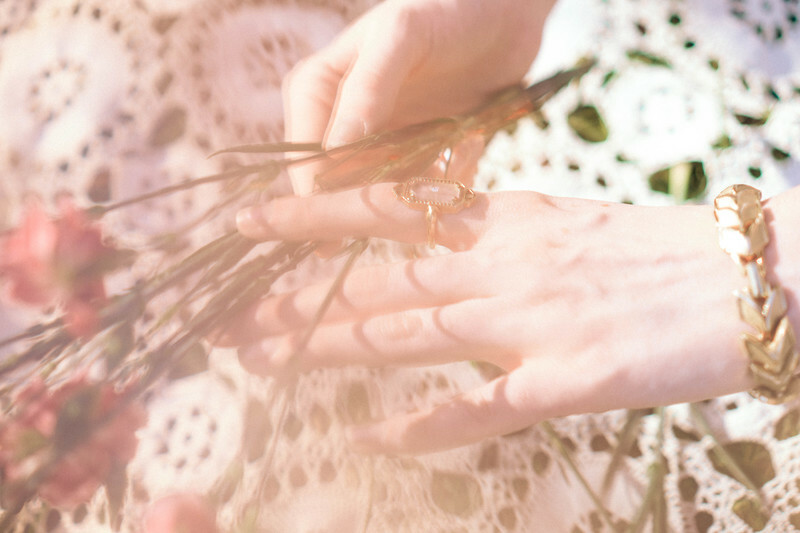 Elissa took charge of artistic direction for the shoot, selected a boho ethereal concept, created a mood board for inspiration, modeled and photographed the shoot. 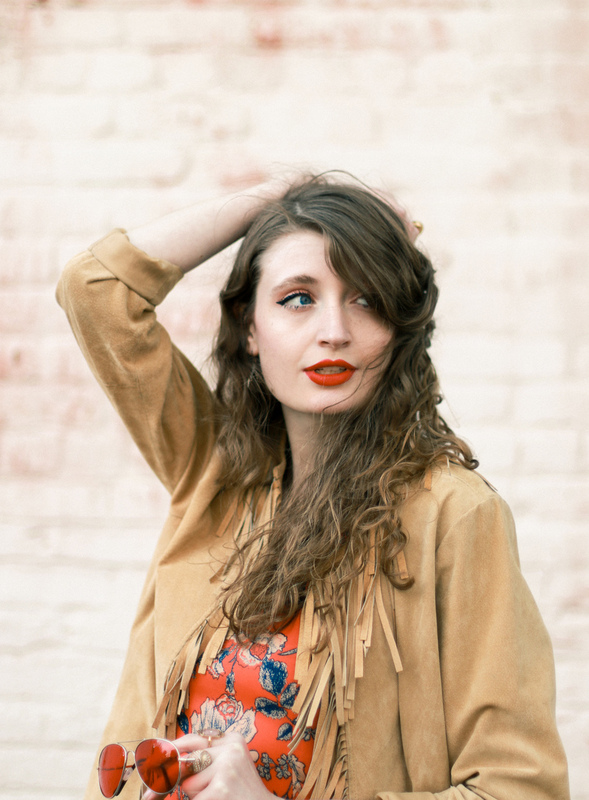 She drew inspiration from vintage style aesthetics as well as film photographs. I styled the fashion for the shoot and modeled in it as well. 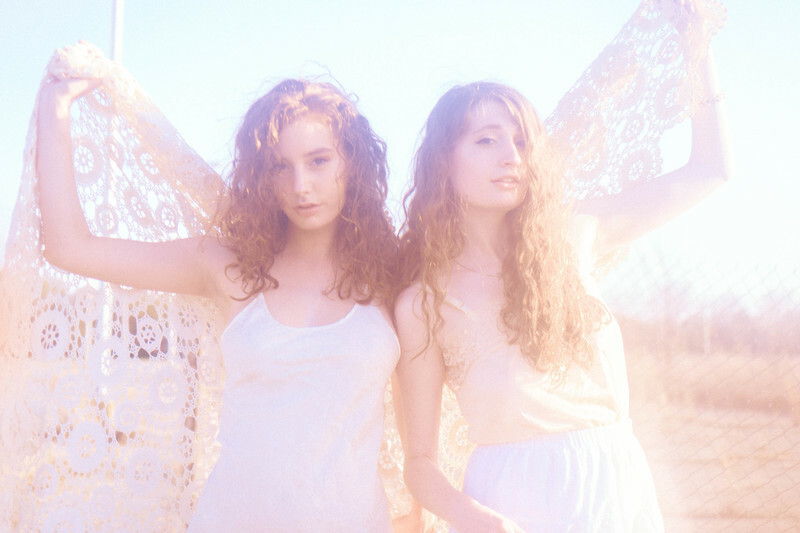 I wanted the colors in the looks to feel very ethereal so we opted for pieces in white and cream colored hues. I kept accessories to a minimum. Kate modeled in the shoot as well as photographed it. 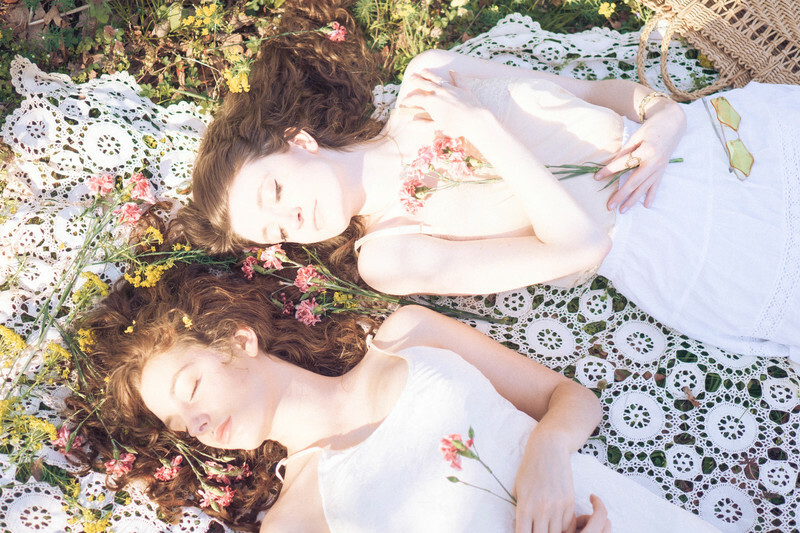 The dreamy boho feel of the editorial evokes a strong sense of nostalgia and yearning for decades past. 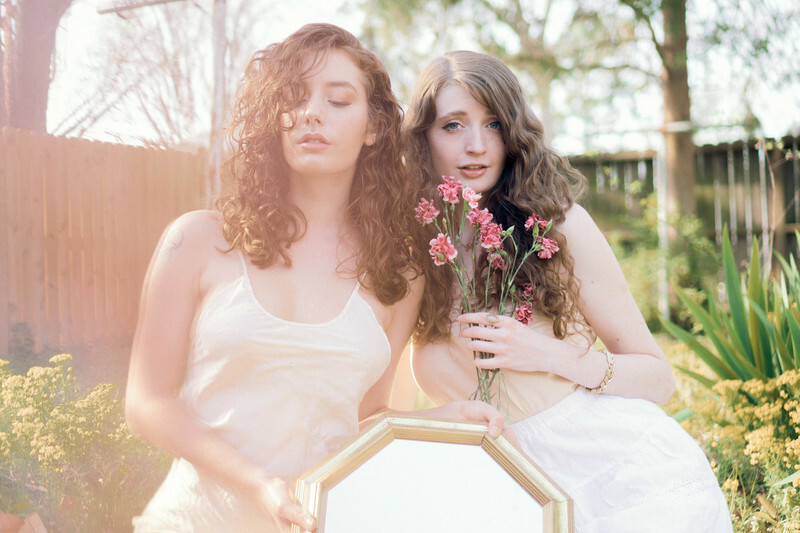 The photos almost feel like memories of hazy seventies summer days. Fashion continually impresses me with how it allows the wearer, or viewer, to transport to a different time and space; I think that's one of the reasons that styling fascinates me so. Hello! When Gabi Day of Bright Body recently reached out to me regarding a collaboration, I immediately hopped on board. I've been following Bright Body on social media for a while now and I've always been intrigued by their organic hair and skincare products. Day founded Bright Body right here in Richmond, Virginia and we met up at a local coffee shop in Scott's Addition to chat about beauty and the benefits of Bright Body products. At the end of our meeting, Day handed me a bag full of Bright Body products to my delight. She included the gentle toner, texturizing sea salt spray, curly hair sample cleansing kit and moisture locking curl spray. I've been using the products on a daily basis throughout the past few weeks and am very pleased with their quality and efficiency. 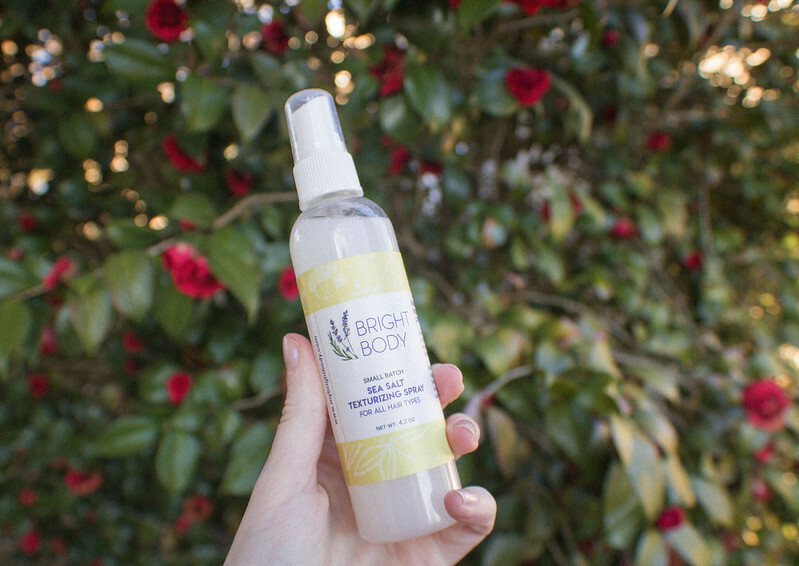 I would definitely list the Bright Body gentle toner and texturizing sea salt spray as my two favorite products that I tried out from the line. Skincare matters a lot to me (trust me- you should see my medicine cabinet full of masks, serums and moisturizers) but surprisingly, I've never actually tried out a toner before. I'm naturally gifted with pretty good skin but I'm happy with the results of using the toner. It's designed for sensitive skin to "clean and shrink pores without stripping the skin or relying on harsh alcohols." Check it out for yourself for $18 here. 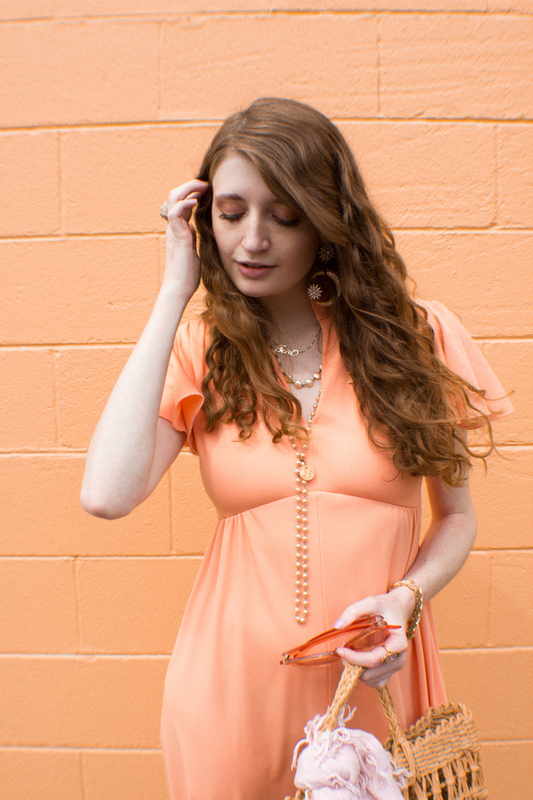 I like the sea salt spray the most out of all of the products I tested. Generally speaking, I don't do much to my hair; I haven't used heat on my hair in about two years and prefer using few hair products. I used to use a milk conditioning spray but after swapping it out for Bright Body's sea salt spray, I don't think I'll go back to it. Because let me just tell you, I am H-O-O-K-E-D on the sea salt spray. It gives your hair hold and texture- just what my curls need. I spray some of it in my hair after showering, let the curls air dry and I'm good to go. I know that I'll be buying more of the product when my bottle of it runs out and I'd suggest trying it out for yourself as well. 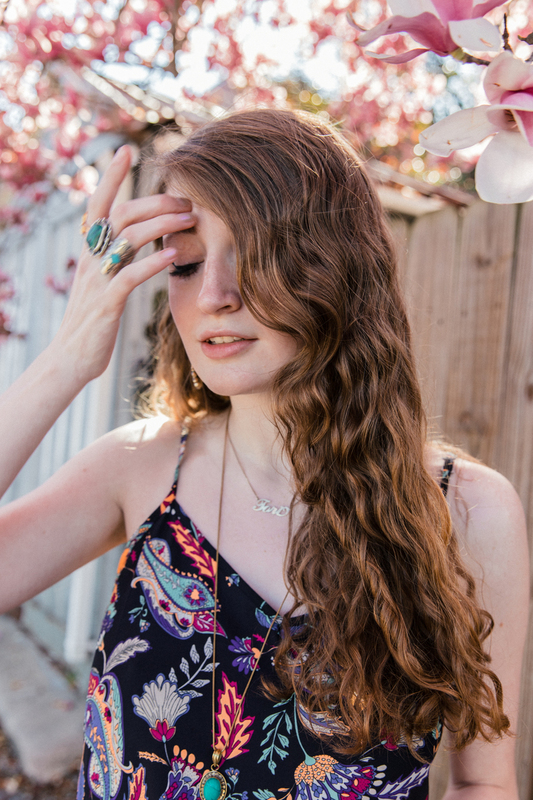 A sea salt spray IS a summer hair essential, am I right? And for just $14, it's pretty affordable as well. You can check it out here. I have mixed feelings towards the curly hair sample cleansing kit (~the shampoo.) After using it for several weeks, my hair does appear "happier." My curls look healthier and more defined but it did take a while for my hair to get used to the product. I definitely felt frustrated with my hair in the first couple of weeks using it; my curls felt greasy and weighed down. However, my curls did adjust to it and now seem more lively than ever. You can check it out for yourself for $25 here. 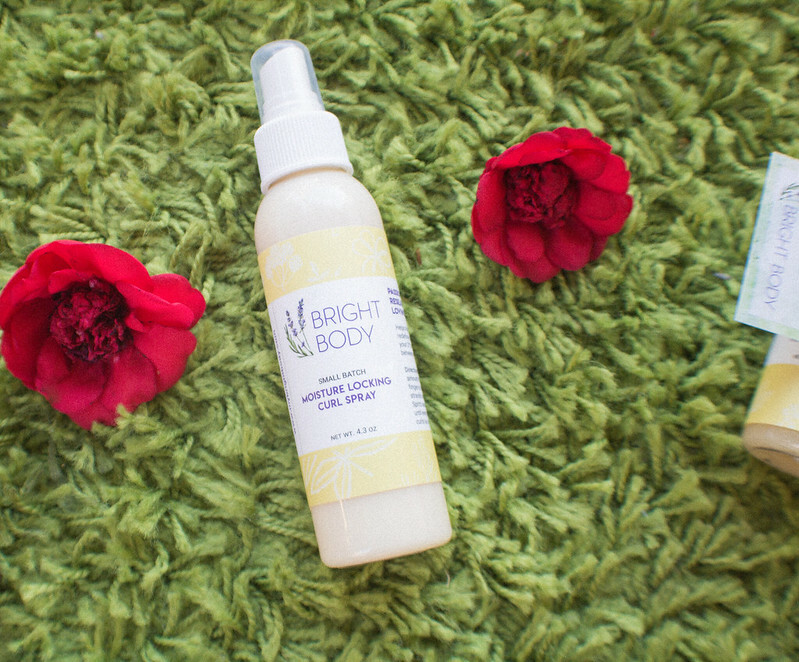 If you're interested in experiencing the benefits of all natural beauty products for yourself, I would recommend checking out Bright Body. 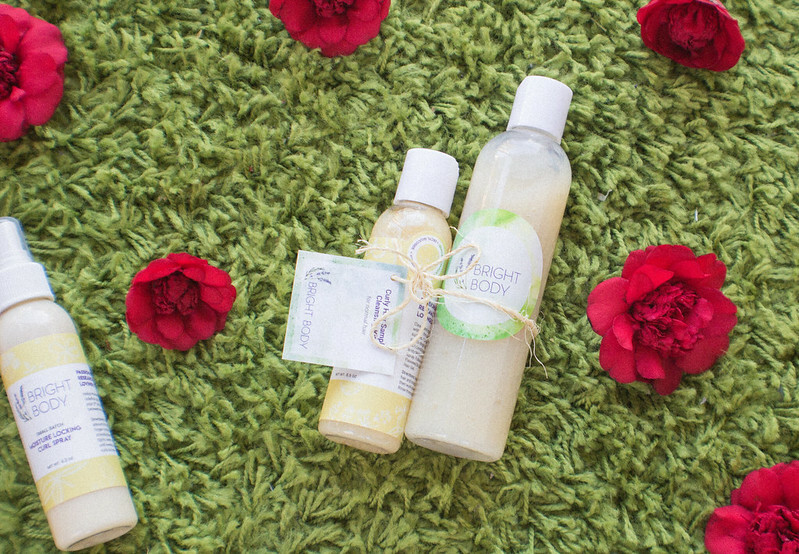 You can shop the products online here or if you live in Richmond, you can find Bright Body products at Nimbus Massage, Hanover Yoga & Wellness, Union Market, Little House Green Grocery, Pelvic Health Systems, Luna Aesthetics & Spa and Belle & Beau Company. Product photos shot and edited by myself. Portrait/outfit photos shot by Madeline Carmichael and edited by myself. *I received Bright Body products to try for free in exchange for this post but this post reflects my honest opinions of the products. I was not paid to write this post. Hello! A couple of months ago, I attended a shopping event for Shop Tailor, an online fashion retailer based in Richmond. I attended a similar shopping event last year and met Taylor Pitera, Shop Tailor's owner. Taylor actually lives in the same neighborhood as me- how cool, right?! I was stoked when she invited me to the event at her home and immediately RSVP'd yes. I grabbed my roommate, Elissa, to go to it with me and we had a blast. Taylor provided snacks, beverages and the opportunity to shop (and try on!) Shop Tailor clothing and accessories. She has the prettiest "shopping" room set up in her home with carefully curated racks of clothing, plush carpet, a gorgeous light fixture and even a spot to try pieces on. I browsed through the racks and selected a couple of items to try on including this pretty paisley number. 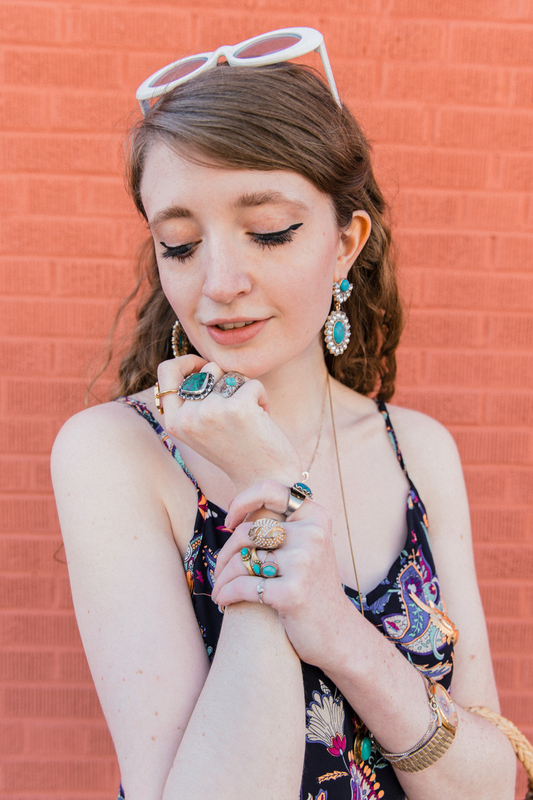 Its vibrant colors, retro psychedelic print and effortless silhouette all called out to me. I slipped it on and knew that it had to be mine. And boy am I glad that I purchased it! It's such an easy dress to style and I've been wearing it practically every week. It works surprisingly well as a transitional piece from winter to spring due to its simple silhouette; I've been layering turtlenecks underneath it, sweaters over it and even dresses underneath of it. I have a feeling that it'll be a favorite in my wardrobe for months to come. 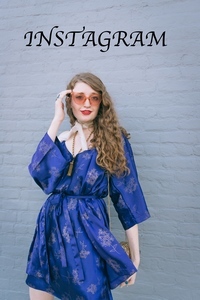 I wanted to play up its pretty seventies appeal for this look so I paired it with a pair of platform denim heels, a vintage basket bag and boho jewelry. I tied a purple paisley scarf around the bag to play up the print of the dress. 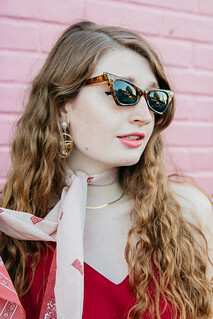 A trendy pair of sunglasses perfected the look. 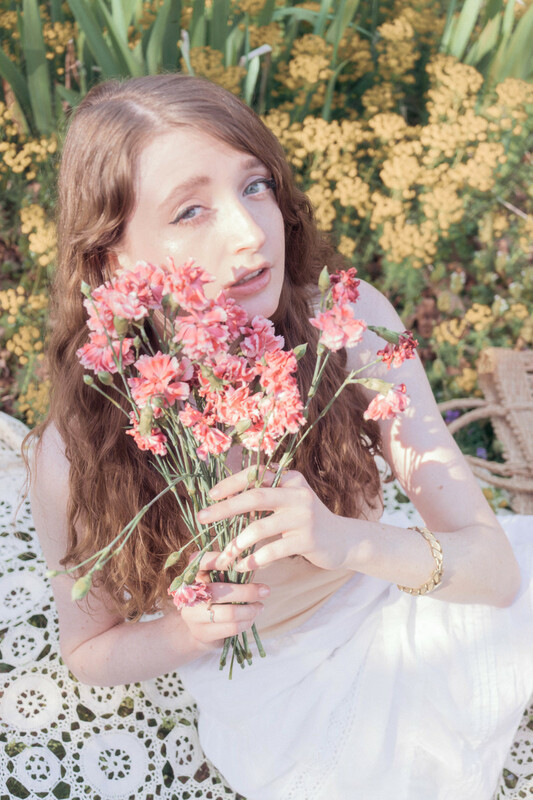 Photos by Rachel Dwyer Photography. You can browse more of her work on her website here or her Instagram here. Hello! When it comes to fashion, I find color to be a major source of inspiration. Strong color aesthetics draw me in time and time again. Maybe it's something about the powerful role that color plays in fashion? Color obviously holds visual appeal but color also possesses psychological properties that affect mood and emotion. I try to harness those powerful properties while styling to create looks that aren't only pretty but that also evoke a certain mood and create some sort of feeling. 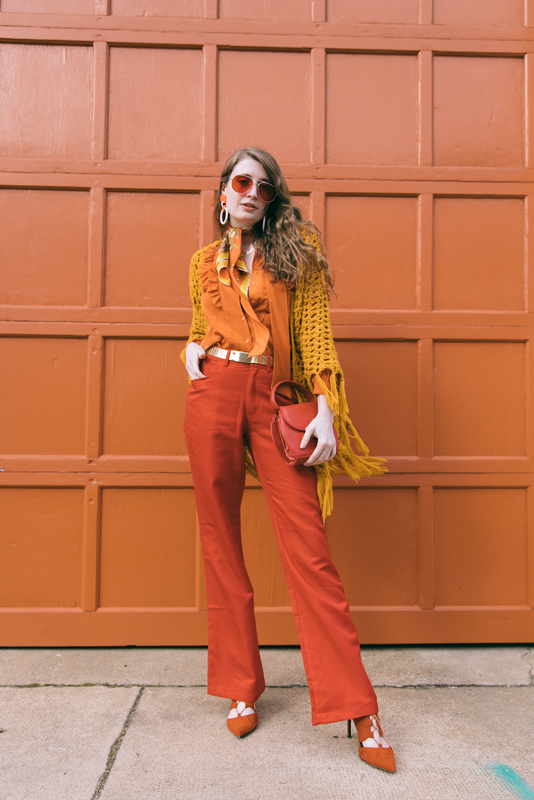 I enjoy styling looks that feel like they stepped out of the seventies so I often find my fashion inspiration in color palettes from years past. I enjoy styling monochromatic looks in particular; there's just something so visually strong about an outfit in entirely one color. 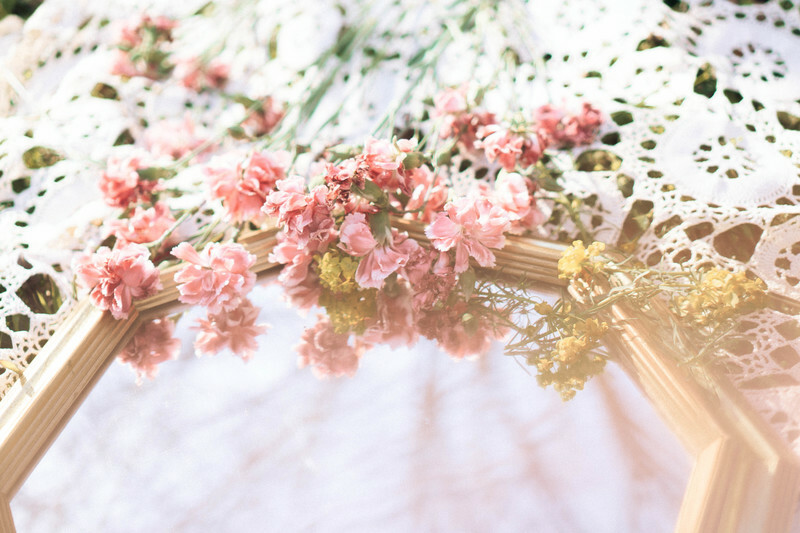 I tend to favor warmer color palettes- think shades of pink, orange, peach, etc. These dreamy hues create a feeling of warmth and happiness; they have a distinct retro appeal to them as well. 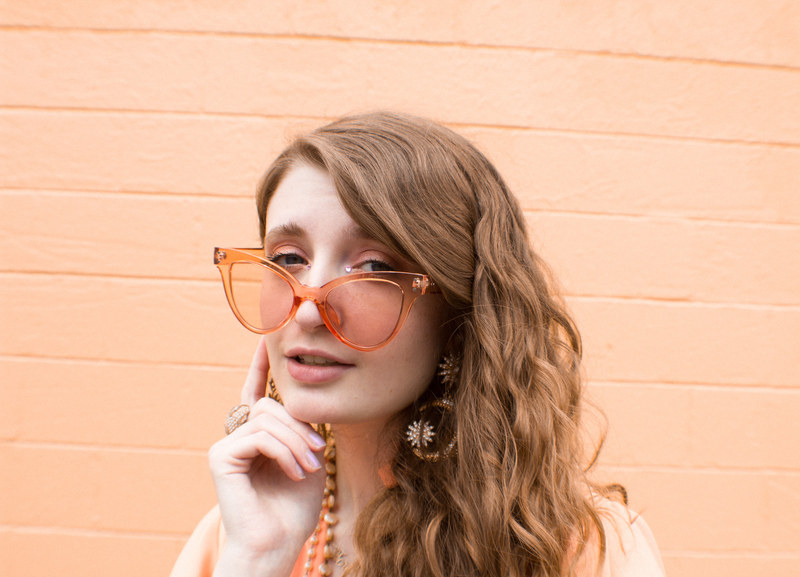 Ethereal orange and pink hues as well as vintage influence played an important role in the styling of the look that I'm rocking in the photos above. 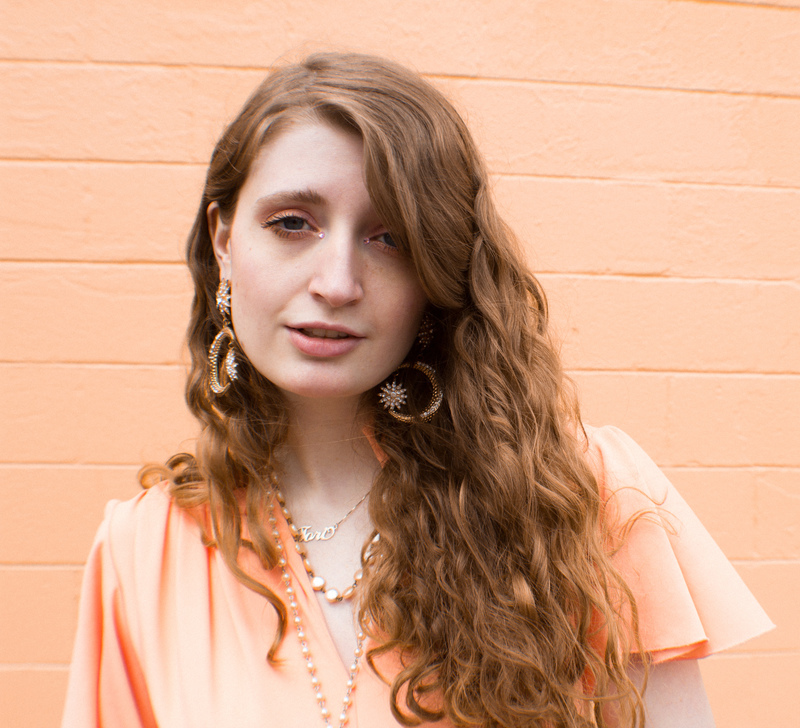 I wanted to go for a sort of "seventies orange creamsicle dreams" editorial vibe so I got to work on playing around with color. 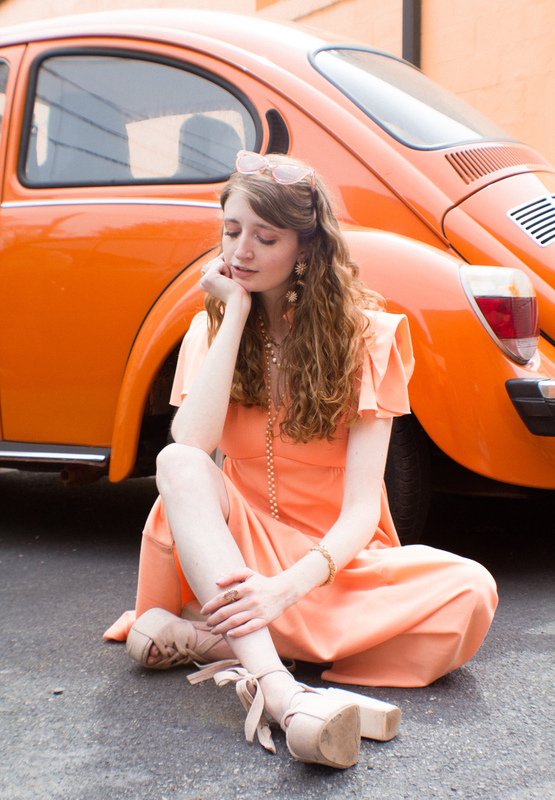 I pulled a gorgeous vintage orange dress out of my wardrobe to style the look around; its eye-catching color and retro style perfectly fit my concept for the look. 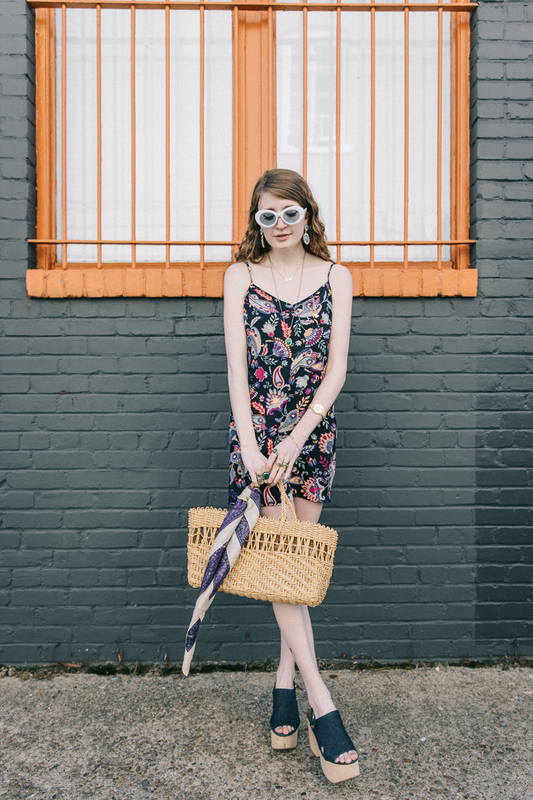 I styled it with a pale pink pair of heels, peachy keen sunglasses and a woven basket bag with a pink scarf tied around the handle. A couple pearl necklaces and golden jewelry added to the sparkly dreaminess to the look. I wanted to keep the look very light, airy and ethereal (almost like floating on a dream) so I avoided dark colors. Do you like to experiment with color in fashion? Is there a certain color that you're drawn to in particular? Let me know in the comments! Hello! I've written about it before and I know that I'll write about it again but the notion that fashion can't be affordable simply isn't true. 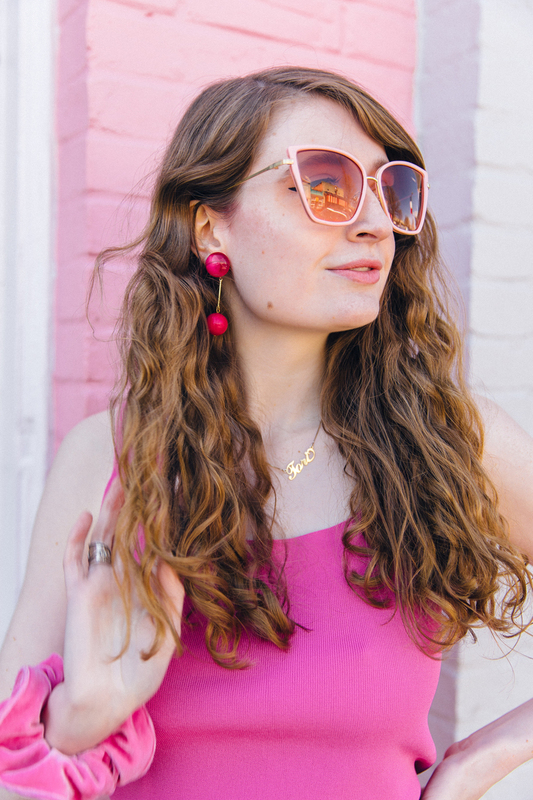 I put together all of my ~looks~ on a shoestring budget and you can do the same thing yourself. Fashion does not have to be expensive by any means; I highly suggest shopping secondhand over buying new pieces. There are SO many different reasons why it makes more sense to shop used rather than new. Buying secondhand pieces rather than new pieces is better for your wallet as well as for the environment. I highly support the "slow fashion" movement and shopping secondhand is a key element of the movement. You can't beat that, am I right? Hello! 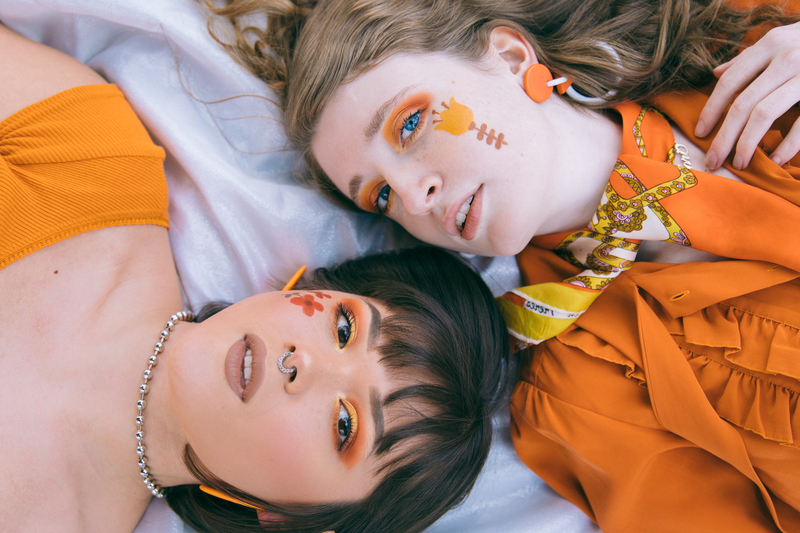 A few weeks ago, I reached out to Elina Oehlert, a VCUArts student who enjoys makeup as well as painting, through Instagram to discuss collaborating on a shoot. She immediately hopped on board and we began talking concepts. 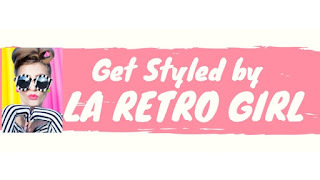 We knew that we wanted to do something more editorial and I suggested something retro-inspired. 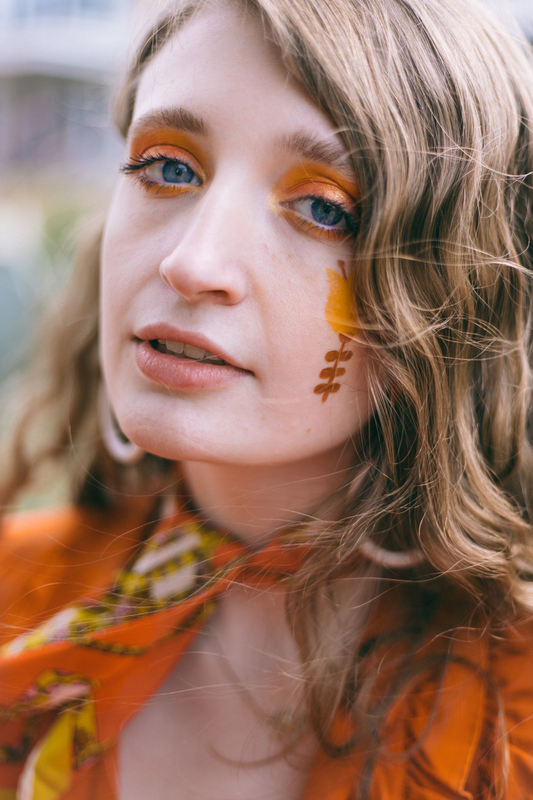 Elina found a gorgeous seventies retro wall paper design online and we decided to draw inspiration from the pattern for our collaborative shoot. 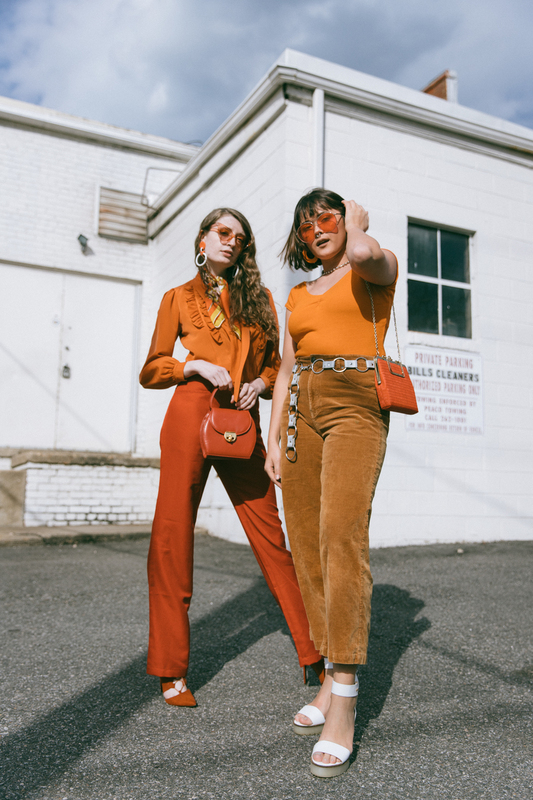 The print encompassed several different floral designs in an interesting geometric arrangement; shades of burnt orange, red and mustard yellow really solidified its retro seventies appeal. 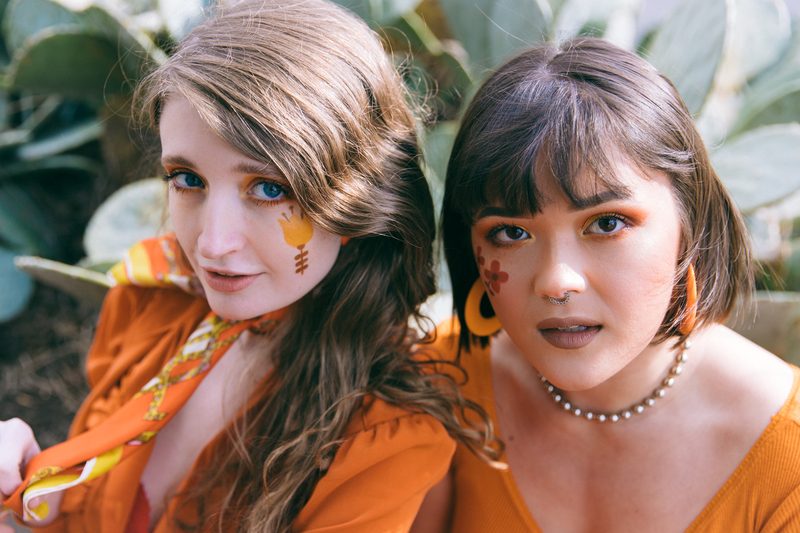 Elina took charge of our makeup for the shoot, painting a couple flowers from the inspiration pattern on both of our cheeks. 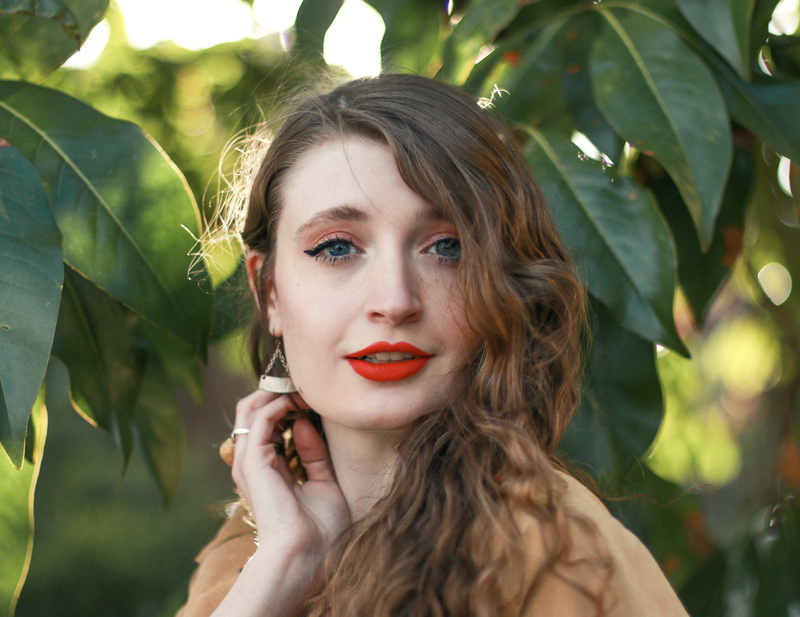 She also worked her magic with eyeshadow on our eyelids, blending away with warm orange and gold hues. Her makeup skills blew me away and I hope to work with her again in the future on more shoots. 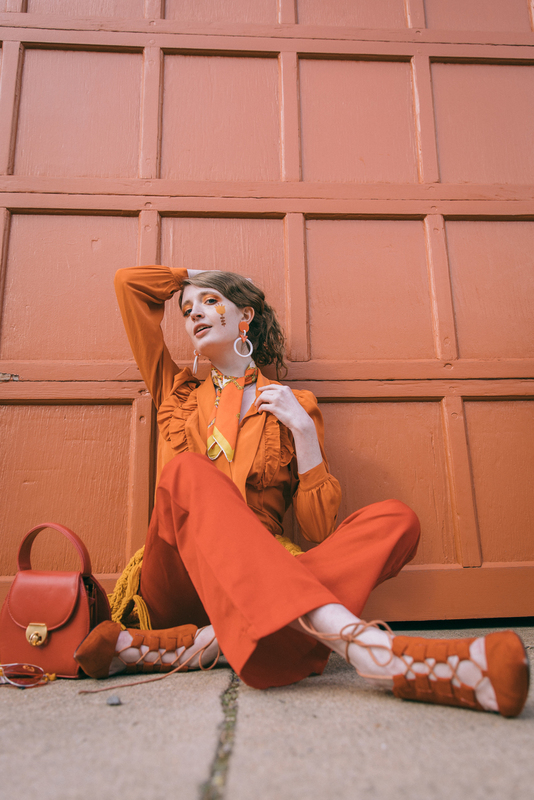 We wanted to focus on color as a key element of the shoot so we played up the warm tones of the makeup with clothing and accessories in orange, red and yellow hues. I grabbed a pair of red, just slightly flared pants from my wardrobe to style my look around. I love the powerful statement that these pants make; I feel like they give off a definite air of strength. I paired them with a pretty, vintage orange blouse. The colorful combination of the pants and the top definitely created an eye-catching statement on its own but I decided to play around with color a little bit more while accessorizing. 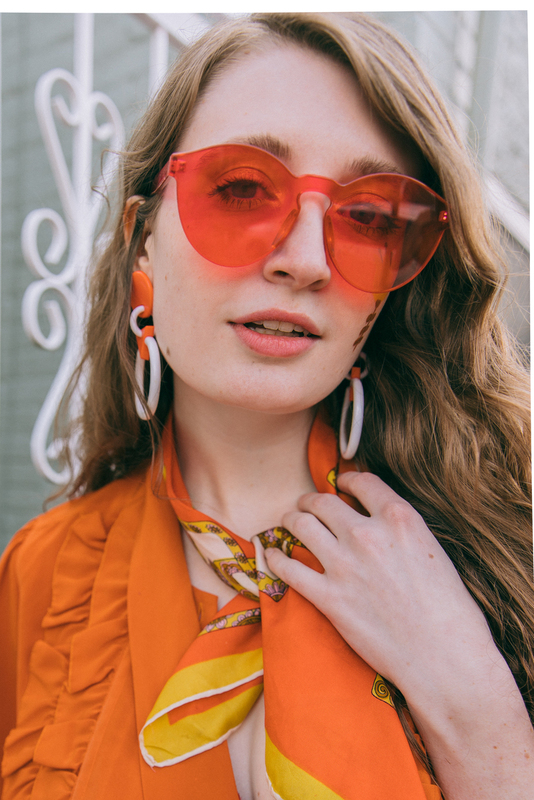 Burnt red heels, a seventies silky scarf, mod earrings, a red purse and fun shades all added to the retro editorial mood of the look. Elina started her look with an effortless pair of tan corduroys. I suggested styling an orange top with the pants and she also slipped into a cool pair of flatform sandals. She added a little bit of a cool mod appeal to the look with a circular belt and a circular beaded necklace. 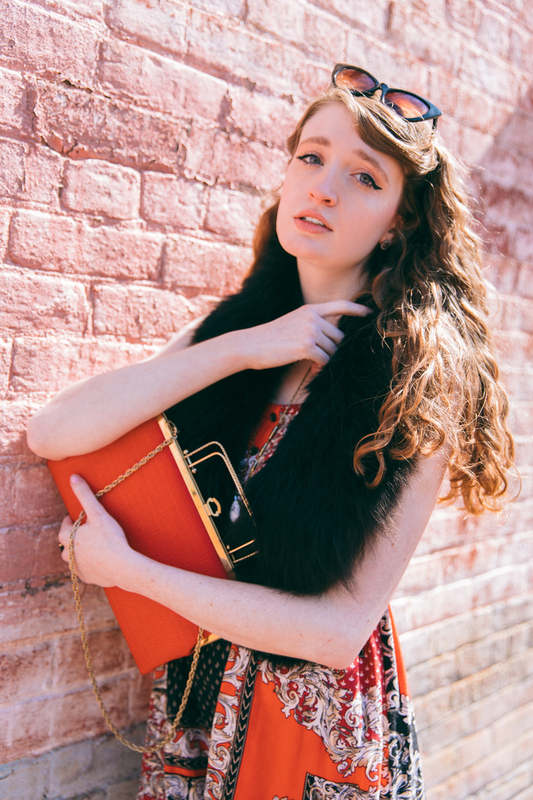 I accessorized her look with some fun shades, a red vintage purse and orange vintage earrings. 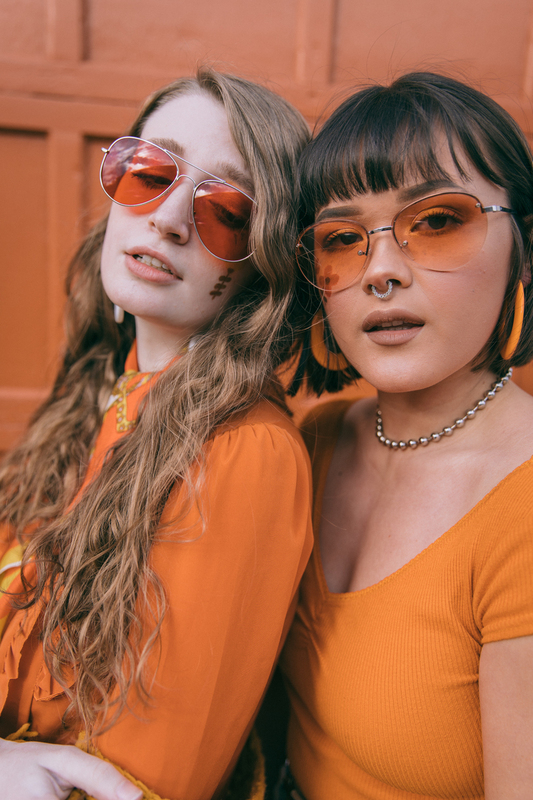 I reached out to local Richmond photographer, Rachel Dwyer, to shoot the collaborative editorial. I've worked with Rachel countless times in the past and am always impressed by the quality of her work. 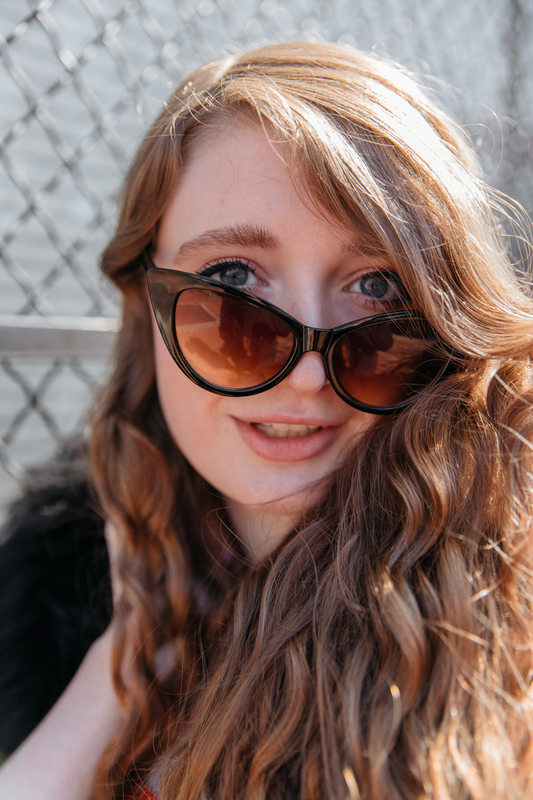 She has an incredible eye for light, angles and capturing looks on camera in a pleasantly unexpected way. 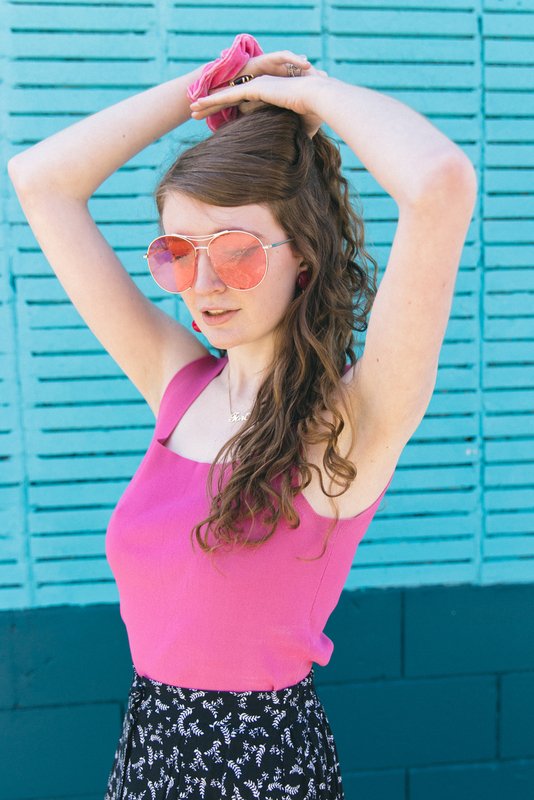 We shot around Carytown and in the Fan and I love how the photos from the shoot turned out. I usually shoot more ~everyday~ looks but it was fun playing around with something slightly more editorial. Stay tuned for more editorial shoots in the future! 1. Layer socks underneath your open-toe heels and sandals. Want to break out your favorite pair of sandals but it's still a little nippy outside? Don't be afraid to break fashion rules and style a cute pair of socks with open-toe heels or sandals like I did with my star printed socks and black velvet heels above. 2. Select dresses and skirts in midi lengths. 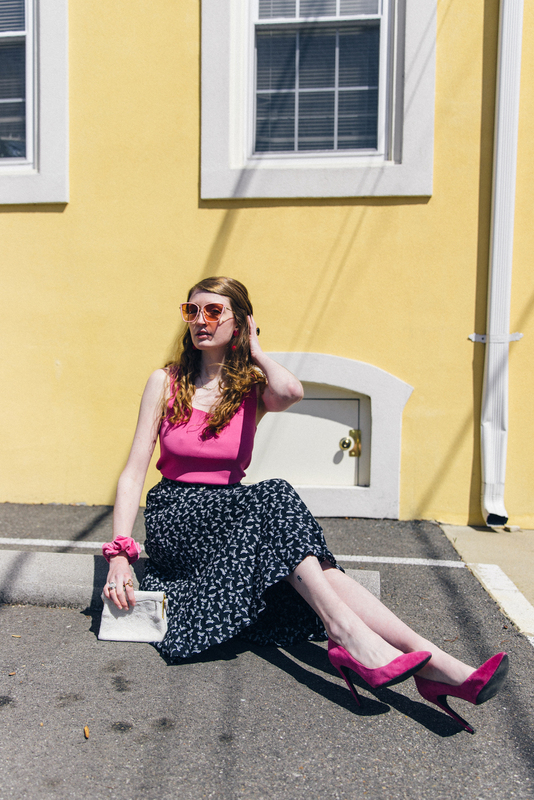 Need help styling your midi skirt? I've got you covered here. 3. 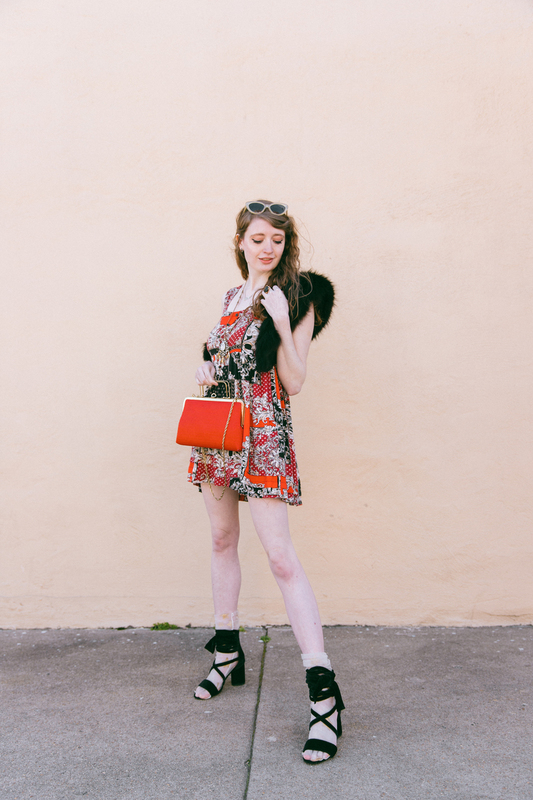 Throw a fur collar on with a spring mini dress. Add warmth to a little spring dress with something cozy but not ~too~ cozy such as a fur collar like I'm wearing above or a knit shawl. You'll be happy you did when a breeze sweeps past you. 4. Keep your favorite turtleneck out as a chic layering piece. 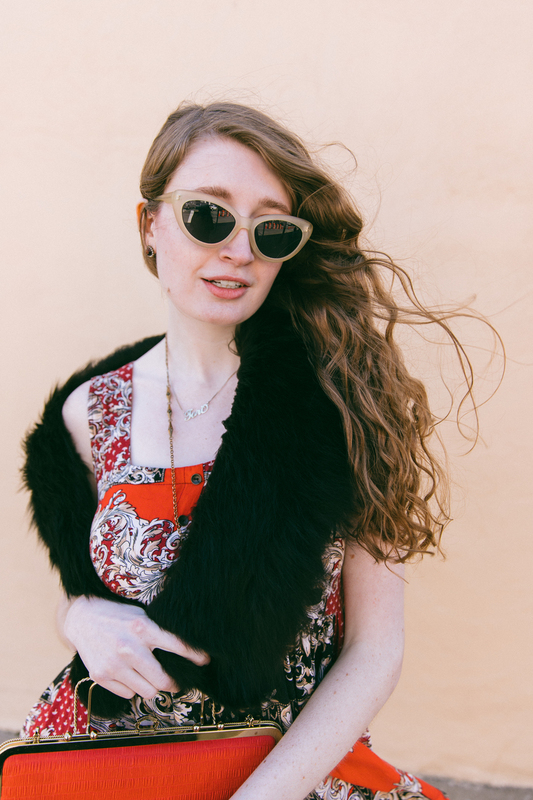 Style it underneath your favorite spaghetti strap dress for just a touch more warmth. 5. Start with more layers in the morning. You can always take off layers off as the day progresses and the weather warms up. What do y'all think? 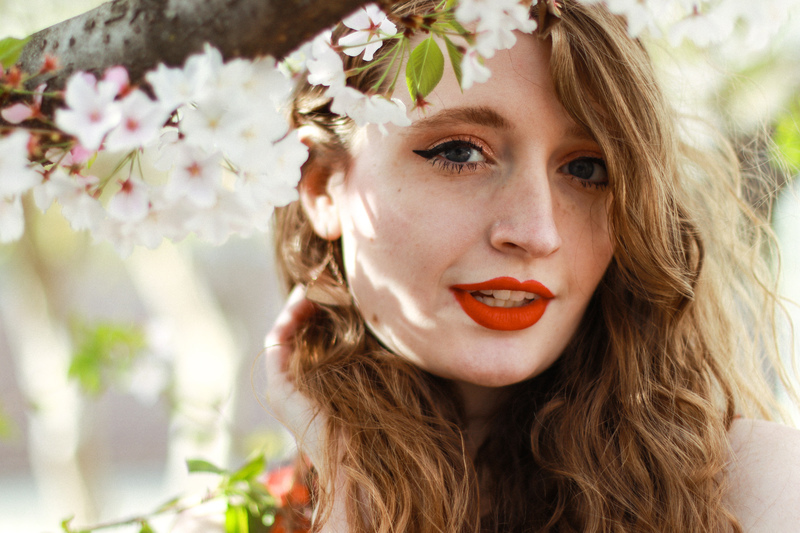 Do you have any more tips for transitioning your wardrobe from winter to spring?